We know, dear reader, we know. You have already laid your head to one side and adopted a knowing look. Stand by, they’re going to lift Maori Lass out of the water and put her into the Gardners Bay shed once occupied by the fabled Wilson Brothers, creators of Varg and many other superb Tasmanian boats. Terry Lean will be in charge, assisted by Captain Crusty (aka Ross Barnett) in the part-time project to complete the tune-up. 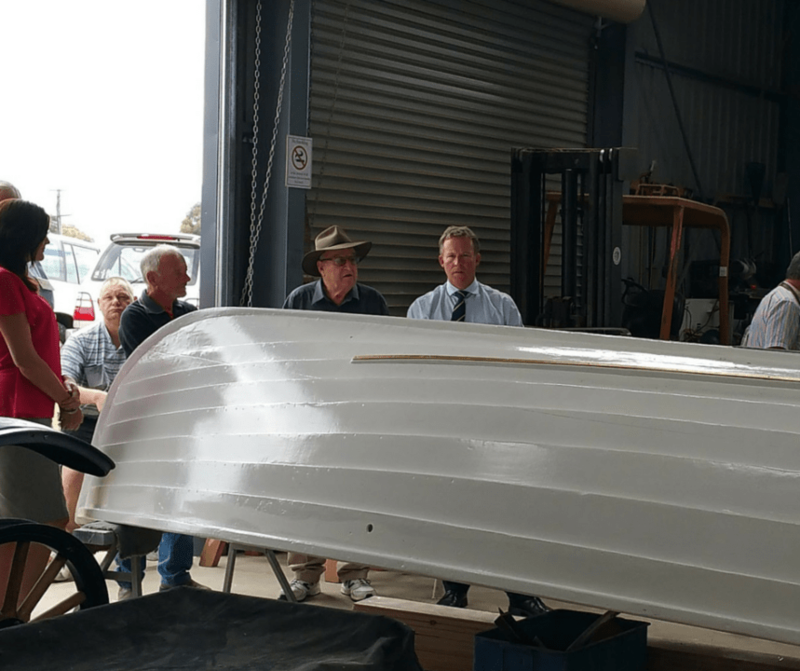 Terry has the runs on the board, having worked on the restoration of the Kathleen Gillett (now in pride of place at the Australian National Maritime Museum in Sydney) and the Jock Muir boat Lahara. Trained at Halvorsen and Gowland, he was shipwright and charge hand for Halvorsen Boats at Bobbin Head, then for Beashel’s in Pittwater before moving to Tasmania and taking up the position of principal tutor and boat builder at the Wooden Boat Centre on the shores of the Franklin River. Terry, who is also a qualified marine surveyor, continues to practice his traditional trade, with many notable boats to his credit. Remind me, Terry, where does this bit go? Maori Lass was designed by HE Cox and built by fellow New Zealander Ron Andrewartha with the help of his two sons, Tom and Bob. The two Kiwi gentlemen took Mrs Trewartha’s advice and christened the boat with an appropriate name. Built from Tasmanian blue gum keel and ribs with celery top pine planking, she was designed for true ocean sailing. The boat has proved herself well up to that task, having spent considerable time in Sydney, the Great Barrier Reef, Darwin and around the world via Singapore, the Suez Canal, Panama Canal and across the Pacific. Mrs. B. has just told Terry and Ross they can go home now, it’s 6:00pm. AWBF: So, Roscoe, having started the re-fit back in September, how is that 6 week project coming along? RB: Have you seen the state of those ribs? It’s like a jungle in there! Christmas. We should be done by Christmas. Well, soon after Christmas, anyway. AWBF: That’s OK, Roscoe, but the next festival is just 13 months away. Do you reckon you’ll be clear by then? We need our Dock Master back, after all. Arunta is an 18 foot Fazackerley built in 1968 for the Kingston Sea Scout Group. The Scouts knew their prized dinghy needed some work, as she was leaking and looking sad. Lacking the skills to repair Arunta, they asked the Channel Men’s Shed (CMS) at Margate for help. 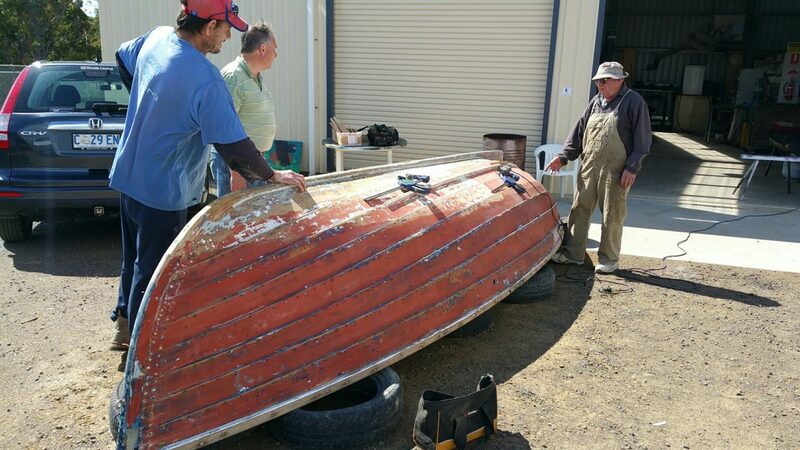 Fortunately, the shed’s membersh ip includes veteran boat builders Graeme Nicholls and Adrian Deane, who are regular participants in the Australian Wooden Boat Festival. Over the last few months Graeme, Adrian, other CMS members and work skill trainees have given Arunta a thorough restoration. Fazackerley enthusiasts will be interested to know that Arunta is an 18 foot long clinker Scout Patrol Boat which carries a sailing or rowing crew of seven (including the helmsman). This design was a departure from previous patrol boats built by R.F. (the John Bowen, Abel Tasman, Van Dieman, Bay King) in that it is lighter and narrower. The planking is King Billy and the keel is hardwood. Other components such as the centreboard case and thwarts appear to be King Billy as well. 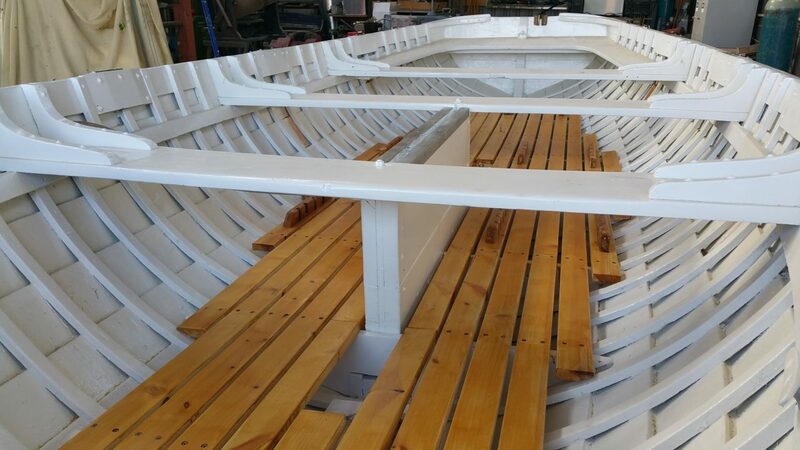 Work carried out at the Channel Men’s Shed included re-fastening of two rowlock blocks, construction of new floor frames as well as stabilisation of the bottom of the centreboard case using stainless steel rod set in epoxy. Arunta also had cracks around the garboard strake which were stabilised and re-caulked. New flooring, rubbing strips and a completely new paint system from International Paints mean Arunta is ready for many more years of service to the Sea Scouts. ‘Good for another fifty years’, Adrian Deane told Premier Will Hodgman on his recent visit to The Channel Men’s Shed. Hopefully the Kingston Sea Scouts will bring Arunta for display at Australian Wooden Boat Festival in February 2017. Imagine for a moment a drowned forest, deep in the cold tannin-dark waters of a Tasmanian highland lake. Hundreds of silent trees, still firmly rooted into the floor of the lake have been left where they are for decades. When the water rose behind the new dams and turbines of the Hydro Electric Scheme, these trees, many of them hundreds of years old, were laid to rest in a watery gloom from which they would never emerge. Until now. 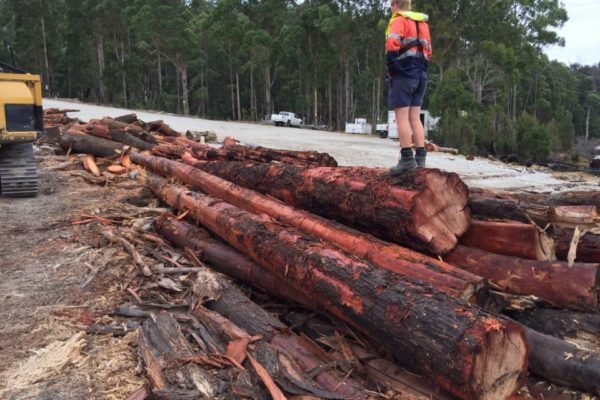 A Tasmanian forest management company called SFM has launched operations at Pieman Lake, using modern techniques and equipment to reclaim drowned timber from as deep as 28 metres below the surface. The low oxygen, dark and cold conditions have seasoned this timber in a remarkable way. Reaching a moisture content suitable for boat building and fine furniture making in a matter of months, these rare timbers include Huon pine, celery top pine and black sassafras – highly valuable treasures for builders of traditional boats. We have yet to hear reviews from Tasmanian shipwrights using the resource, but if the company has the science right, this is the tip of a very large iceberg. Operations, under strict environmental controls, are already underway at Pieman Lake, but the company has explored Lake Gordon and Lake Burberry for potential harvesting there.